Electromagnetic micro-clutches are mechanical components that operate electrically but transmit torque mechanically. They operate by utilizing an electromagnetic force generated by passing a current through a coil to couple and release the rotor and armature, thereby engaging and disengaging the output. When the coil is energized, the magnetic field pulls the armature plate axially to engage the rotor friction surface, completing the torque transmission mechanism. Electromagnetic micro-clutches provide a swift, smooth operation and precise control of small precision equipment where accuracy in torque and response must be maintained. 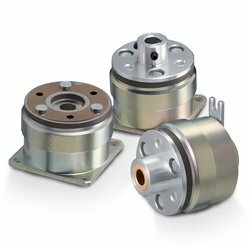 EM micro clutches are compact, lightweight and ideal for applications involving selective rotational power transmission outputs from a primary source. This model is offered in a range of sizes, with flange and shaft mount styles. Three different armature types are available. This space saving design combines high performance with a relatively long lifetime. The CYT design allows for the stator to be easily mounted to the shaft. The armature may be configured with or without internal bearings, depending on the radial load and nominal speed. Further custom variants can be realized by pairing a sprocket, timing pulley, v-belt pulley or shaft to the armature. Our 102 (micro-clutch) and 112 (micro-brake) models share the same basic design as our other friction clutch / brake types, which may be configured in flange and shaft mount styles, with a range of sizes. 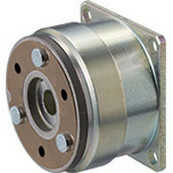 Our flange mounted micro clutches are designed to be short in the axial direction to require less installation space. The shaft-mounted EM micro clutches use a bearing-mounted stator and are designed for easy axial shaft placement. Miki Pulley offers three types of armature assemblies in two mounting types, providing you with six different electromagnetic micro-clutch options to meet your unique requirements. Our micro clutches feature a torque range of 0.4 ~ 2.4Nm and operating temperature range of -10~ +40°C. We also provide the shaft mounted CYT model EM micro-clutch, featuring a bearing-mount stator, making installation easy. 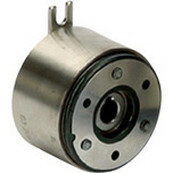 The CYT offers transmittable torque of 0.1 ~ 2.4Nm and operating temperature of -10~ +40°C. Contact Miki Pulley for more information or request a quote on the micro-clutch you need.